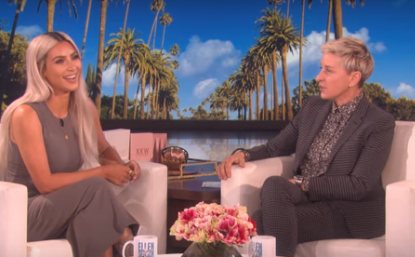 Kim Kardashian West was on Ellen DeGeneres‘ talk-show “Ellen“ recently and she accidentally revealed the gender of her 3rd child with Kanye West. Kim, who is expecting baby number three via a surrogate, was talking about trying to get her first daughter, North, used to the idea of a baby being on the way by throwing a baby shower. “I thought, I really do want a baby shower because I want her to feel that something’s coming,” she said. North was on the next day opening the toys and gifts people brought for the baby, Kim said, and she mentioned: “Mom, since baby sister is not here, I think I need all of her toys in my room, and I’ll play with them and make sure they’re all okay for baby sister,” revealing that the baby is a girl. She also discussed looking for a name for the baby and asking the guests at the baby shower to write their suggestions down for her to look at. Kim was also on ET to discuss how surrogacy is different from pregnancy, and why she finds it difficult. “You know, it is really different,” she told ET‘s Keltie Knight. Anyone that says or thinks it is just the easy way out is just completely wrong. I think it is so much harder to go through it this way, because you are not really in control. And, you know, obviously you pick someone that you completely trust and that you have a good bond and relationship with, but it is still … knowing that I was able to carry my first two babies and not, you know, my baby now, it’s hard for me. So, it’s definitely a harder experience than I anticipated just in the control area. She also discussed her kids being excited that a baby is coming. While she’s not sure how son Saint West would react because he’s little and doesn’t get it yet, daughter North is pretty excited, she said. They are excited. I mean, I don’t know if they don’t feel it as much because they don’t see my big belly and probably hear me complaining every two seconds. But, we do talk about it a lot, so I think they are really excited. I think my son, I don’t know how he is going to react because he doesn’t get it yet, but my daughter is really excited.